New details continue to emerge about the alleged college cheating scheme involving Felicity Huffman and Lori Loughlin. On Tuesday, March 12, E! News obtained court documents which show that both Huffman and Loughlin have been charged with conspiracy to commit mail fraud and honest services mail fraud. The Desperate Housewives alum and the Fuller House star are among over 40 individuals who have been charged in connection with the scandal. According to the FBI affidavit, the scheme involved getting students admitted into elite colleges. The same day that the news broke, E! News confirmed that 13 defendants were taken into custody in the Los Angeles area, including defendant Huffman. The FBI affidavit states that Huffman and her "spouse," William H. Macy, made a purported charitable contribution of $15,000 to participate in the scheme on behalf of her eldest daughter. She "later made arrangements to pursue the scheme a second time, for her younger daughter, before deciding not to do so," the document reads. Huffman and Macy are parents to Sofia Grace Macy, 18, and Georgia Grace Macy, 16. Macy, who has not been charged, was seated it the gallery in court on Tuesday afternoon as Huffman faced a judge. Per the court orders, the Oscar nominee will surrender her passport and is required to seek pre-trial approval for any travel. Huffman was also granted a signature bond of $250,000 and has been ordered to appear in federal court in Boston on March 29. The signature bond requires the 56-year-old actress to sign a promise to return to court, but does not require a deposit of any cash or property with the court. While there are many theories as to why Macy has not been charged in this FBI investigation—code name Operation Varsity Blues—there's been no official statement from authorities. New York Law School professor and former prosecutor Rebecca Roiphe shared one theory with Vulture, stating, "One of the possibilities is that the husband is far less culpable. Maybe it's possible that the government has far more evidence than it's laid out here, and in this evidence, that Huffman played a far more significant role than her husband." As for Loughlin, she surrendered to the FBI on March 13 and was taken into custody. She was later released on $1 million bond. Loughlin will be allowed to retain her passport for travel on a current project in British Columbia, her next court appearance was in Boston Federal court. The U.S. Attorney's Office for the District of Massachusetts told E! News that Loughlin had not yet been arrested on March 12 as she was out of the country. She was contact by federal authorities to come back and turn herself in. Loughlin's husband Mossimo Giannulli was arrested on March 12 without incident. USC has now announced that it has placed holds on the accounts of students who may be associated with the alleged admissions scheme; this prevents the students from registering for classes or acquiring transcripts while their cases are under review. "These students have been notified that their status is under review," USC said in a statement. "Following the review, we will take the proper action related to their status, up to revoking admission or expulsion." Meanwhile, William "Rick" Singer, 58, was charged racketeering conspiracy, money laundering conspiracy, conspiracy to defraud US and obstruction of justice for his alleged involvement in the scheme. E! News has confirmed that Singer pled guilty to all counts. According to a press release, Singer owned and operated the Edge College & Career Network LLC ("The Key") – a for-profit college counseling and preparation business – and served as the CEO of the Key Worldwide Foundation (KWF) – a non-profit corporation that he established as a purported charity. The release stated that between approximately 2011 and Feb. 2019, Singer allegedly "conspired with dozens of parents, athletic coaches, a university athletics administrator, and others, to use bribery and other forms of fraud to secure the admission of students to colleges and universities including Yale University, Georgetown University, Stanford University, the University of Southern California, and Wake Forest University, among others." On Monday, April 8, the Department of Justice announced that 13 parents and one university athletic coach have agreed to plead guilty to charges of mail fraud and honest services mail fraud. Huffman is among the parents set to plead guilty. In a statement, Huffman said, "I am pleading guilty to the charge brought against me by the United States Attorney's Office. I am in full acceptance of my guilt, and with deep regret and shame over what I have done, I accept full responsibility for my actions and will accept the consequences that stem from those actions. I am ashamed of the pain I have caused my daughter, my family, my friends, my colleagues and the educational community." She added, "I want to apologize to them and, especially, I want to apologize to the students who work hard every day to get into college, and to their parents who make tremendous sacrifices to support their children and do so honestly." "My daughter knew absolutely nothing about my actions, and in my misguided and profoundly wrong way, I have betrayed her," Huffman said in the statement. "This transgression toward her and the public I will carry for the rest of my life. My desire to help my daughter is no excuse to break the law or engage in dishonesty." 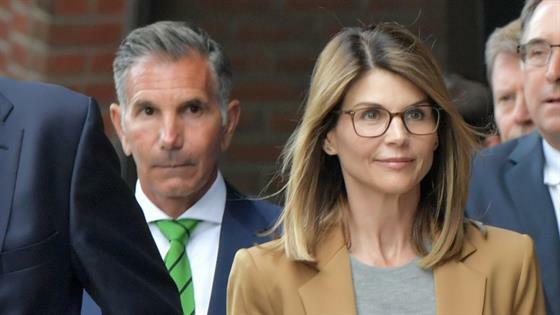 On Tuesday, April 9, it was announced that 16 parents involved in the cheating scandal, including Loughlin and husband Giannulli, face additional legal trouble. "Sixteen parents involved in the college admissions scandal were charged today in Boston in a second superseding indictment with conspiring to commit fraud and money laundering in connection with a scheme to use bribery to cheat on college entrance exams and to facilitate their children's admission to selective colleges and universities as purported athletic recruits," a Department of Justice press release stated. The press release also explained, "The second superseding indictment also charges the defendants with conspiring to launder the bribes and other payments in furtherance of the fraud by funneling them through Singer's purported charity and his for-profit corporation, as well as by transferring money into the United States, from outside the United States, for the purpose of promoting the fraud scheme." Additionally, the press release provides insight into the possible sentencing that the parents are facing, stating, "The charge of conspiracy to commit mail and wire fraud and honest services mail and wire fraud provides for a maximum sentence of 20 years in prison, three years of supervised release, and a fine of $250,000 or twice the gross gain or loss, whichever is greater. The charge of conspiracy to commit money laundering provides for a maximum sentence of 20 years in prison, three years of supervised release, and a fine of $500,000 or twice the value of the property involved in the money laundering. Sentences are imposed by a federal district court judge based upon the U.S. Sentencing Guidelines and other statutory factors." On April 15, Loughlin and her longtime husband pleaded not guilty to one count of conspiracy to commit mail and wire fraud and honest services mail and wire fraud and one count of conspiracy to commit money laundering. Both waived their right to appear in court for arraignment. This article was originally published on Wednesday, March 13 at 12:25 p.m.